Coi "Carrots roasted in coffee"
This very unique dish comes from Daniel Patterson of Coi restaurant in San Francisco, and is published in his book, "Coi: Stories and Recipes" (a fantastic read). Its genesis is documented in a home-cookoff with Rene Redzepi in this article. Carrots are roasted low and slow on a bed of coffee beans, and pick up their aromatic flavor. 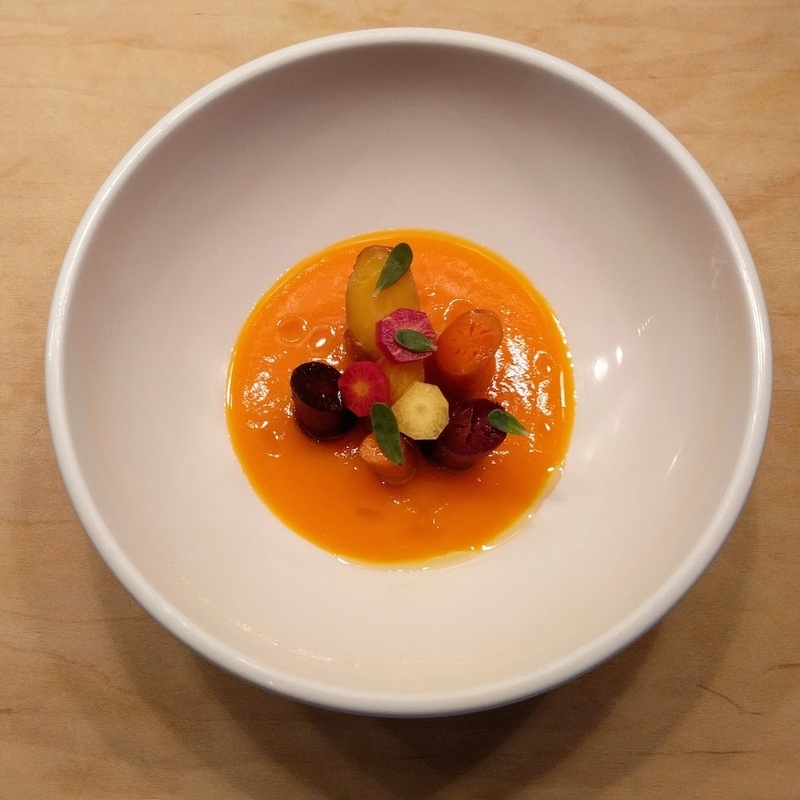 The dish is topped with crunchy raw carrot slices dressed in rice vinegar, and served with a 'broth' made of carrots and mandarin orange juice. I know that I haven't gotten the flavors down for this dish yet. As there are relatively few components to the dish, every one must be perfectly flavored and balanced against the others. Personally I've found my broth recipe to be a bit on the sweet side, which can overpower the delicate flavor of the roasted carrots (the original broth recipe calls for pure carrot juice, which I lack the equipment to make and had a hard time finding). It's something that I'll need to iterate on, but regardless, this is the version that I served to guests during a dinner party. Prepare the broth (this can be done 1 day ahead of time and reserved): roughly chop the carrots and add to a pot; barely cover with water. Cook covered until carrots are very tender, about 20 minutes. Strain carrots, add to a blender with 140g of the cooking water (you can add more as necessary to get the consistency you desire). Add the tangelo juice, salt and rice vinegar to taste, and blend thoroughly. Adjust seasoning (the broth should be slightly acidic), and adjust consistency with cooking liquid to thin or xanthan gum to thicken. Strain and reserve in refrigerator until needed. Prepare the roasted carrots at least 3 hours in advance. Preheat the oven to 350F. Wash 6 of the heirloom carrots well, but don't peel. Toss with olive oil and salt. Add coffee beans to cover the bottom of a heavy pot, add the dressed carrots on top, and roast covered until very soft, 1 1/2 - 2 hours. Remove the carrots from the oven, cut into serving pieces with biased tops, and let cool. Reserve in refrigerator until needed.